Because I have chosen to be a sole practitioner and my practice is concentrated in four primary areas, my clients benefit by getting personalized, quality service that is beyond comparison. I have come to the point of having a law office and creating a website for it called Law For Locals through an interesting and, some might say, circuitous route. It is truly being a local with a breadth of life and business experience that I feel makes me uniquely qualified to handle, and be empathetic with, your transactional issues, be they related to real estate, business or any kind or estate planning. So here’s my background. I was born in New London and my folks moved to Essex when I was 2 years old; I learned to walk in an antique house on Main Street, Essex back when Main Street was affordable for a young building contractor and his family. I have lived in Essex all my life, leaving only for the 8 years of boarding school and college. Early on my Dad thought I should have a little extra structure and informed me I would be going away to school. I was fortunate enough to land at the beautiful Kent School in Kent Connecticut, where I discovered the sport of crew and became the Varsity Coxswain of a very well renowned high school program, capping my career there with an undefeated senior season as Captain. I then went on to another beautiful school in another equally spectacular setting – Dartmouth College. Since I had already learned to learn at Kent, college was quite pleasant for me and left me some time to begin developing business and entrepreneurial skills through a variety of jobs from catering to bicycle repair. Upon graduation, I returned to Essex knowing only that I wanted to be in a small town near the shore and work somehow with people. Lo and behold, I found myself selling cars at Westbrook Honda. As a well – educated car salesman with pretty good inter personal skills, or as one of my Aussie colleagues described it, the ability to “get alongside” people, I enjoyed tremendous success. At a time when dealer arranged financing was just starting, I took over the position of Business Manager and took great pride in building up the department beyond what anyone expected. However, after 3 years in the car business I decided to go to law school, believing I could use the education to be self – employed; either in business or law. 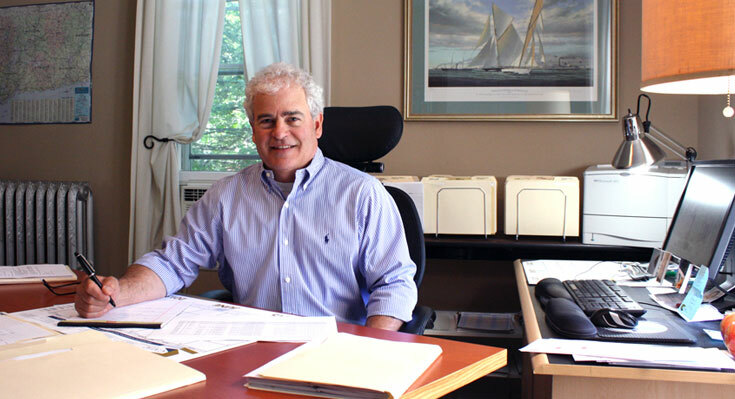 After graduating from The University of Connecticut Law School in 1991, I worked as a clerk for a Federal Bankruptcy judge for almost two years in Bridgeport and then for the oldest little law firm in New London County, both of which gave me great knowledge and experience. However, soon enough, the entrepreneurial itch got the better of me. I was pretty sure I’d be a better boss than employee. So, I looked around in 1994 for a business opportunity crying out to be developed and, recalling fondly many cappuccinos in France and Italy, decided Essex needed a coffeehouse. I created Ken’s Coffeehouse in 1994 and it quickly became a very cool and pleasant place to have a cup, visit with friends and enjoy the atmosphere. The next year, realizing we also needed a basic grocery store in Essex, I opened Village Provision Company on the site of Joe Bella’s defunct gas station. That too was greatly rewarding as I learned a new business and continued to provide critical services to the good people of the surrounding communities. I soon learned that the retail food service business takes its toll in hours and stress – especially when you are one person trying to run two operations catering to local and tourist traffic from sunup past sundown 365 days a year. I sold Ken’s in 1999 and Village Provision Company in 2000 and am pleased to see that they both continue to prosper in the hands of my successors, to the benefit of they and the community. After a brief sabbatical following the sale of VPC, I decided to get back into the practice of law, now that I felt I could do it on my own terms, having re-established myself sufficiently in the community to attract some business. As fate would have it, on my first transaction back in practice, while representing my sister on the sale of her Essex home, I met a lawyer in Chester representing the Buyers who was looking to leave the practice to concentrate on raising her young children. After a short time, I took over her business and have now been back in the practice of law, in Chester for over 14 years. So far, I have been able to help thousands of people in the tri town community of Chester, Deep River and our surrounding towns with real estate closings, estate planning, probate administration, and all kinds of small business matters; and I look forward to being able to be of assistance to you as well. Please feel free to contact me with anything with which you think I might be able to assist. If I cannot offer expertise in the area needed, I will help you find the right lawyer for the job.